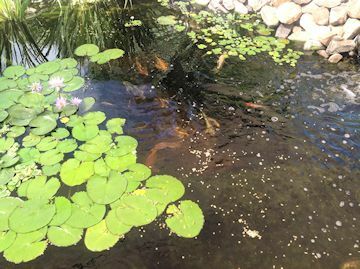 The other day I realized that I had not slowed down enough to provide an update on my Koi pond. The last time I posted on it was 6 months ago, in December of 2013. A lot has happened since then. I’ve taken out all of the Yerba Manza. I discovered that it is just too invasive. Even though the original plants were still potted and submerged they send out runners – scads of runners – that seek rocks and other potted plants. The runners will even go over the edge of the pond into anything beyond. As a result the Yerba Manza was beginning to crowd out other plants and the need to cut off the runners was becoming a monthly chore. In their place I have decided to try some Spider Lilies and Cardinal Flowers. At the beginning of May we reinstalled the shade cover over the pond. It continues to do its job but I have found that the material itself has stretched due to winds that buffeted it up and down. Right now it is very saggy. When we take it down in the fall we will resize it to take out some of the slack. We finally broke down and purchased a Laguna Brand, 55 watt, UV clarifier/sterilizer light. It’s rather large – about 5 feet in length. 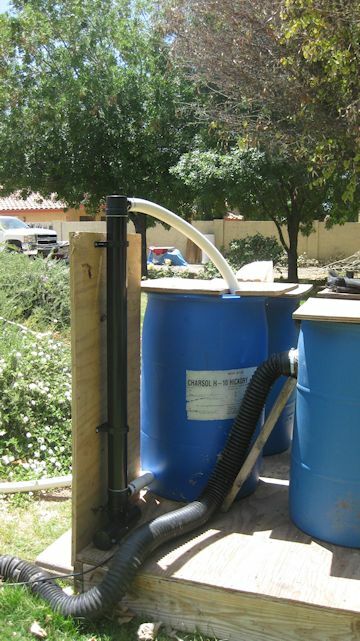 The external 4 barrel filter system continues to do its job but it simply could not keep up with the tremendous algae bloom that occurs in Arizona with intense daily sunlight and temperatures of 90 to 100+ degrees. The light has only been in operation for a little over a week but the difference in water clarity is amazing. 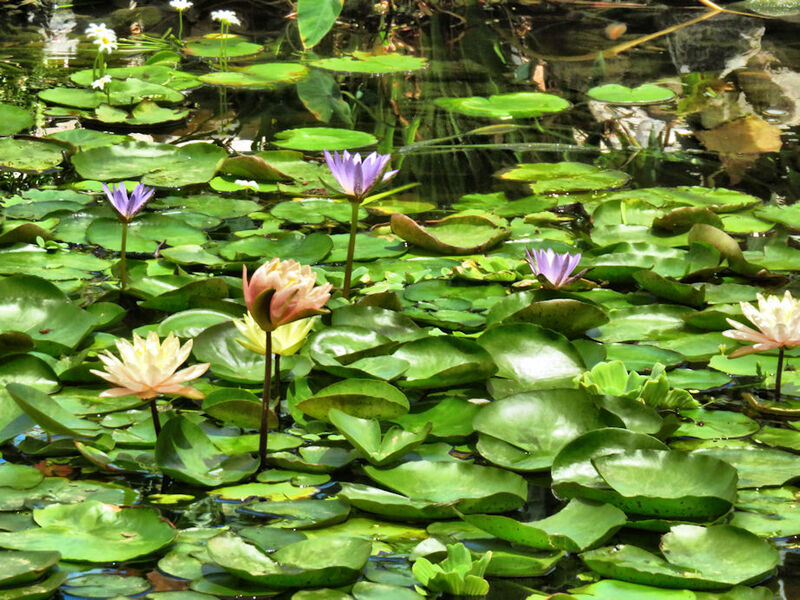 It seems to get rid of the smallest algae particles that are suspended in the water and that simply flow through the 2 regular pond filters. We placed it in-line, above ground with the external 4 barrel filters. As a result the water clarity has improved tremendously. The water clarity is so good we are able to see the fish anytime, day or night. We have 4 under water pool lights and we can see the Koi grazing at night among the pebble bottom and the potted plants. 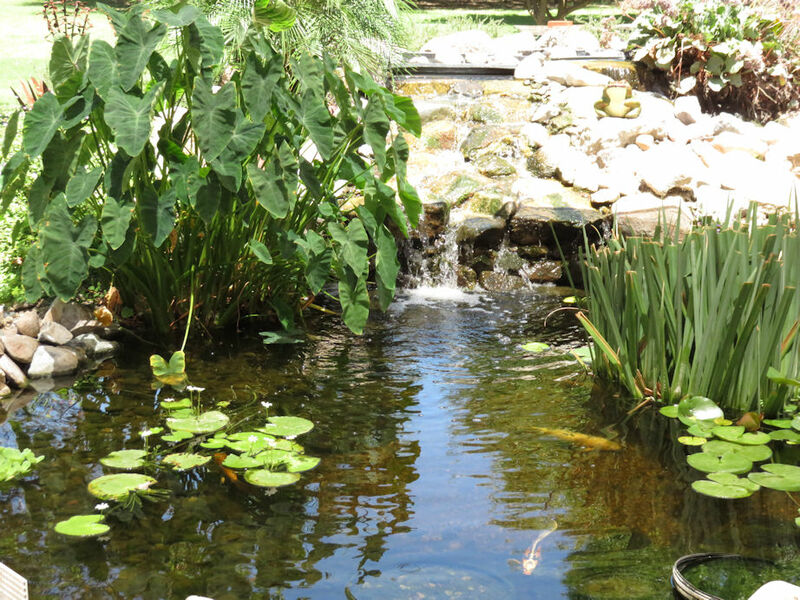 It is really so nice to sit by the pond whenever the mood strikes and watch the Koi. I ordered and received one of those Styrofoam rings with netting to introduce floating plants into the pond. I wouldn’t get another. The Styrofoam breaks too easily and it continually floats toward the filter system. I found myself moving it away from the filter several times a day. I finally had enough of it and removed it. So much for that gadget. We have new visitors to the pond – snails – itty, bitty, tiny snails. We think they came in one of two ways: either on a plant I ordered over the internet or on the feet of the many birds that visit the pond. Either way, they are in the filters…everywhere. This past week I received some Assassin Snails and immediately dumped them in the pond. It seems an Assassin Snail’s mission in life to eat other snails. I hope so. I guess we will find out soon enough. Our other visitor is a cane toad. He appeared one night about a week ago. We surmise he came in on our irrigation system or else, bird legs again, but as an egg. 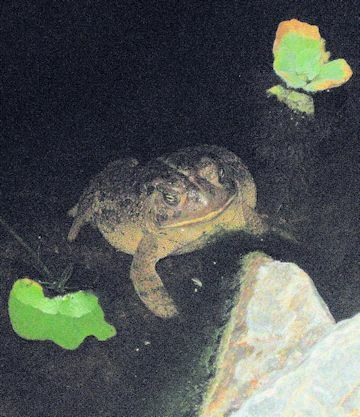 Cane toads are nocturnal. This one is a juvenile, maybe 6 to 8 inches long. I read that they can live for 10 years and grow to 2 feet in size. He’s not afraid of humans and will even let us touch him. He’s a very calm, little fellow. Our greatest problem seems to be the heron that nests somewhere on our street. Our street is made up of one acre lots, irrigated. There is no curb, gutter, sidewalks or street lights. It is a dark, cool oasis in the midst of urban living and we love it and apparently, so does the heron. We think it visits the pond in the middle of the night. The only way to confirm it is to stay up all night or get a night vision, motion detector camera. I think the camera will happen sooner than staying up all night for many nights to confirm the heron. We know it is taking fish and when it doesn’t take them it has wounded several Koi mortally. 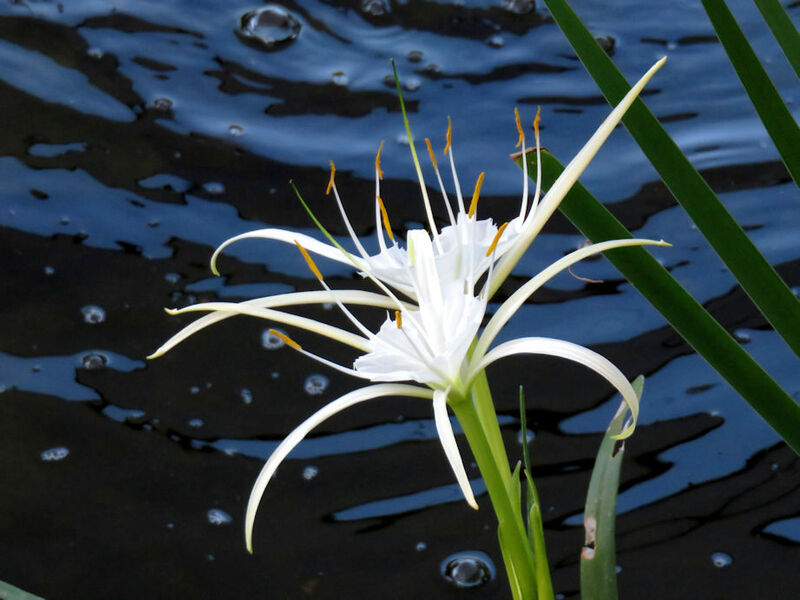 It seems to prefer Koi that are white or nearly all white in color although a few orange Koi have also disappeared. Just as the water clarity has improved for our visual enjoyment it has also allowed the heron to spot its prey more easily. We have lost more fish in the past month than in all of last year. Not a happy scenario. I will continue to research the best deterrent to this fellow’s dining regimen.